ccindex K logo. Courtesy of ccindex. 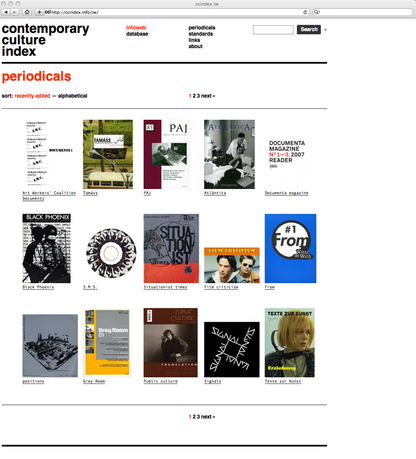 Contemporary Culture Index (ccindex)—an open-access, multidisciplinary, and international bibliographical database, and its related bibliographical annotation, ccindex infoweb—addresses two tendencies in current scholarship: a homogenization of research sources due to the “search engine effect” (i.e., to believe that what exists and is known is what is retrieved by a commercial search engine) and a multiplicity of modes of access to online materials. 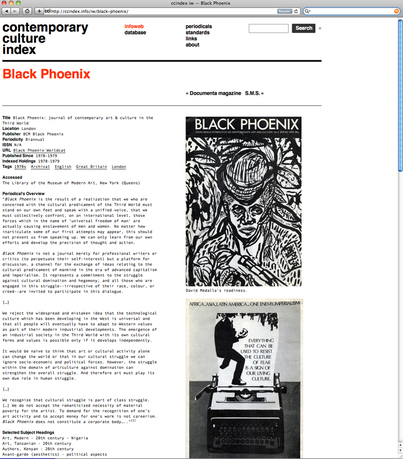 In order to complement current approaches, ccindex is developing a mobile device interface for its current bibliographical operation and expanding the indexing of rare architectural periodicals not indexed anywhere else in order to include them in the broad, and critically aware, cultural context of our database and infoweb. ccindex is an online cluster of bibliographical information. A two-sided enterprise, ccindex is composed of a standard bibliographical tool for research and an illustrated and annotated web operation about the periodicals indexed in the database, and the self-reflective processes involved in its production. An accretive tool designed to be activated by the users, ccindex's retrieval of what's deemed obsolete in conjunction with an international and kaleidoscopic understanding of the contexts in which culture takes place allows for a nuanced world perception of our current taxonomical times. ccindex is represented by Javier Anguera Phipps. He was the serial librarian at the Library of the Fundació Antoni Tàpies, Barcelona. In 2001, he founded ccindex and in 2002, he became the Free Agent Media archivist. ccindex was invited to participate in Manifesta 7 and receives critical support from the Stichting Egress Foundation, Amsterdam.